I have made some changes to my blog appearance as you can see. Despite doing a reasonable amount of prior work on my test blog, the change still took some time. I had to transfer haloscan commenting system which fortunately worked. Though apparently haloscan is shifting to JS-Kit at some stage. The comments will then get stored again on blogger which may be preferable. I have been wanting to switch to a 3 column layout to separate out blog related access (see left) and external links (see right). Following that schema means that recent comments should be on the left but it seems to fit better on the right because of the word count. I got the template from ourblogtemplates but have modified it moderately. It has way too many options, especially for colours, and I will have to weed it out at some stage. I also need to modify some of the colours such as mouseover. The width may be slightly large for some monitors at 980 pixels, though only 3% of my visitors have a resolution as low as 800 pixels. Unless it is a bizarre mating ritual. 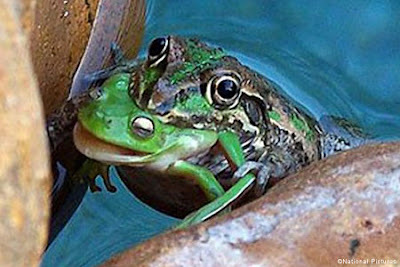 I am aware of cannibalism in the natural world. For example, I believe lions have been known to eat other big cats. But for some reason I find this picture mildly distressing. Similarities have been noted with the Law of Moses. For example in the International Standard Bible Encyclopedia parallels are identified for Exodus 21:2, 15, 18, 22, 24, 28-32; 22:7,10; Leviticus 19:35f; 20:10; 24:19f; 25:39f; Deuteronomy 19:16f; 21:15f, 18f; 22:22; 24:1, 7. Legal codes from ancient history can be helpful in understanding why specific laws existed. They can show us that a certain way of thinking was more widespread in the ancient world. It is claimed that Moses borrowed from Hammurabi because the latter antedates Moses. Other legal codes include those of Ur-Nammu and Eshnunna. There is no intrinsic problem with the Bible having parallels to a prior code. The parallels may be because similar issues were being faced by the community. And the Bible claims to be historical, thus it interacts with nations surrounding it. God can approve of the practices of other nations or disapprove of them. Frequently we see the prophets condemning Israel for her actions which are worse than their pagan neighbours. Because God may approve or disapprove of a nations laws it is important to look at the differences as well as the similarities. Nevertheless, I am not convinced that Hammurabi antedates Moses. I have previously mentioned my disagreement with secular ancient chronology. Scripture alone demands an Egyptian rewrite. My knowledge of Babylonian history is limited. I am going to propose an alternative date for the code based on scriptural considerations and various secular synchronisms. Pinches dates Hammurabi c. 2000 BC. Van De Mieroop dates him c. 1800 BC. Other suggestions based on shorter chronology suggest c. 1700 BC. Based on king lists Hammurabi son of Sin-mubalit son of Abil-Sin belonged to the First Babylonian Dynasty. Comparing secular Egyptian and Babylonian synchronisms and and correcting the dates from the biblical data we have Hammurabi ruling about the time of Moses at the earliest. While I am confident in the reduction of the date of the Hammurabi Code, I have not established significant synchronisms between Babylon and either Israel or Egypt. More data or a closer review of the data may lead to a more exact and more confident date. This suggests that the the correspondence between the Hammurabi Code and the Law of Moses is unlikely due to the latter's dependence on the former. 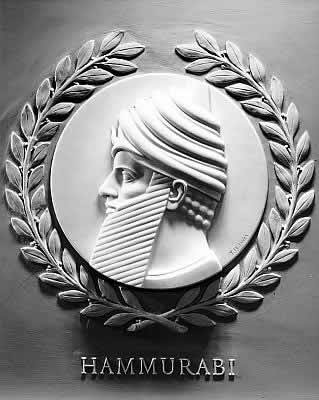 The Hammurabi Code may be dependant on the Mosaic Law based on chronological considerations alone. Both codes could relate to underlying customs of the Ancient Near East. Or they both could have some relationship to prior laws. Many who hold to the Mosaic authorship of Genesis propose Moses had access to more ancient Hebrew records. In an article about gender issues and the Bible, theologian Vern Poythress makes some important observations. Poythress is discussing text that has implicit meaning which translators make explicit. An explicit semantic content in the original has to be inferred in the translation, while what was only inferable from the semantics in the original becomes explicit in the translation. The shift from direct statement to inference is significant. It is a subtle change in meaning. To appreciate this difference fully, biblical scholars have to shift their point of view somewhat. Many biblical scholars spend most of their time thinking and writing about the theological value and interpretive implications of the passages they study. Their goal is to make explicit the many implications of the text. If two wordings leave the theological implications the same, they are equivalent from the scholar's point of view. Of course we are also removed from the authors and readers of the original text by culture and time, so what may be implicit is still more obvious to them than to us, at least until our way of thinking changes. Though this is not quite what Poythress is getting at; rather the sentence construct: what is said and what is implied but left unsaid. And this is a significant issue to which not everyone may necessarily subscribe. Do we get the main meaning and ensure that this is fully grasped in the translation, or do we carry across as many meanings as in the original. If the original possibly has a double meaning and we can keep ambiguity, do we? Poythress goes for the latter and I am inclined to agree. Translators console themselves by saying that "all translation is interpretation." They are right. The most accurate translation can only be accomplished when we thoroughly understand the meaning of the original, including all its nuances in all their dimensions. Only then are we ready to produce a translation that conveys not only the main meaning but all the nuances of the original. But the motto, "all translation is interpretation," is turned into another meaning if we then use it as a blanket justification for rewriting the text in the way that an interpretive commentary would do. An interpretive commentary expounds the implications of a text, and makes explicit what the text leaves implicit. Such has not generally been the job of mainstream translation. But the American religious public has become lazy about the Bible and busy with other affairs. So a translator may try to include the extra information in the text explicitly, in order to make it easy for them. He paraphrases. He explains metaphors in ordinary prose. He expands tightly packed theological exposition. By doing so, he provides a commentary through which he hopes to help readers to understand the Bible better. But when he labels his commentary "The Bible" and "translation," he has blurred the line between translation and commentary in an unfortunate way. I tend more and more toward literal translations. Sure, they may not read quite as well as dynamic translations, but to really understand Scripture I think this is what is needed. Dynamic, easy-reading, and children's Bibles have their place. To pick up the main themes of Scripture it is useful to read an easy-reading, flowing version. Reading a variety of versions allows one to contemplate other possible meanings that may not occur to him when reading his usual translation. But I think it is false when essentially dynamic versions claim to be just as accurate or more accurate than formal versions. However translation always has limitations. Formal versions need to be aware that some limitations of language cannot easily be bridged. For example the preservation of word order into English is unnecessary and possibly inaccurate. Word order gives meaning more than emphasis in English; best to use normal English word order. I checked the date but it wasn't April 1. Frankly the whole article is hilarious. The Institute of Medicine has released a report on conflict of interest in medical practice. Collaborations between physicians or medical researchers and pharmaceutical, medical device, and biotechnology companies can benefit society—most notably by promoting the discovery and development of new medications and medical devices that improve individual and public health. However, relationships between medicine and industry may create conflicts of interest, potentially resulting in undue influence on professional judgments. ...The committee’s report stresses the importance of preventing bias and mistrust rather than trying to remedy damage after it is discovered. It focuses specifically on financial conflicts of interest involving pharmaceutical, medical device, and biotechnology companies. The committee recommends the implementation of policies and procedures that will reduce the risk of conflicts that can jeopardize the integrity of sci­entific investigations, the objectivity of medical education, the quality of patient care, and the public’s trust in medicine. The New York Times notes the report has stated that doctors, medical schools and hospitals should not accept gifts from pharmaceutical companies. doctors should stop taking much of the money, gifts and free drug samples they routinely accept from drug and device companies. If medicine was fully privatised would this be as great a concern? While money can be a strong conflict of interest, so is ideology. Do people note competing interests based on philosophical, theological, or political beliefs? Is this a bad thing? Should this be extended to democracy? Should any person receiving financial favours from the government (excluding legitimate work done at governments behest) forfeit their vote? Welfare recipients, subsidised farmers, corporations that have specific laws written for them. Are proofs of global warming actually myths? The second is interesting, the amount of ice in the Antarctic has increased over the last 3 decades. That issue 1 is a myth is a pity as I think the biosphere would be more productive if it were warmer, especially in temperate and polar climes. Hopefully the higher CO2 will increase biomass despite lack of temperature increase. He tackles issue 4 via record high temperatures. While interesting, it is not the best way to address it. Cities probably are warming via the urban heat island effect. (Though he is refuting claims, not suggesting these are the best claims). *I would have linked to the Herald article but it has been taken down (as per some news sites' bizarre policies of removing material older than some arbitrary duration). I have not reviewed the site linked to above that has a copy of the story. And here is an attempted refutation of Bolt.